Old Dominion men's aftershave has deep mahogany woods, butter soft Italian leather and sweet tobacco, with just a hint of well aged, dark Patchouli. Rugged, manly, handsome. These words come to mind when describing the scent of Old Dominion men's after shave splash. It has notes of deep mahogany woods, butter soft Italian leather and sweet tobacco, with just a hint of well aged, dark Patchouli. Use Old Dominion After Shave Splash after shaving to help tighten and close the pores. It can also be used as a refreshing cologne. 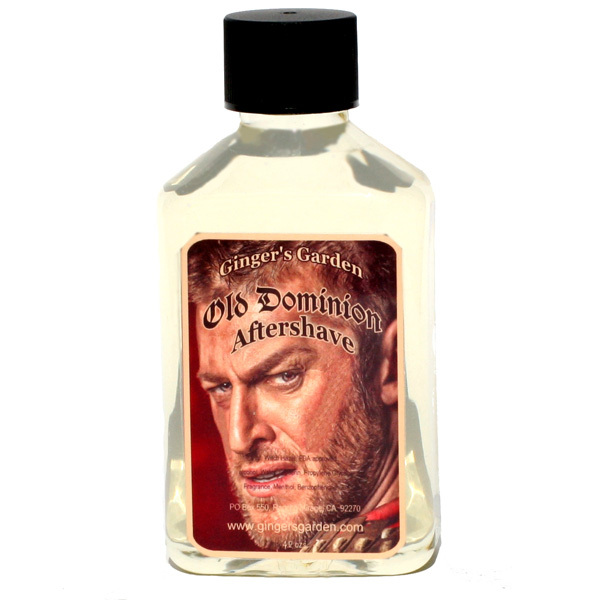 Old Dominion after shave contains menthol, aloe vera and witch hazel for its soothing and antiseptic properties. Old Dominion After Shave Splash has a unique cap with a flip up spout, so it’s easy to dispense and use.. This dispenses just the right amount of Aftershave Splash each and every time. The formula contains natural glycerin, which makes the splash a little thicker, but also easier to use and apply. Ingr: Aloe Vera Juice, Witch Hazel, FDA approved alcohol, Water, Glycerin, Propylene Glycol, Fragrance, Menthol, Benzophenone -2.